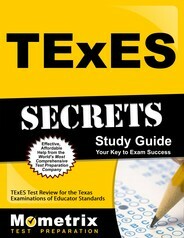 The TExES Core Subjects 4-8 exam is intended for certified educators who wish to teach students in these grade levels. It measures the candidate’s breadth of knowledge in math, language arts, and the sciences in accordance with the official statewide curriculum of Texas. A currently certified educator from another state or country, seeking to become certified in Texas. A candidate currently enrolled in an approved educator preparation program who has been approved by that program to take the test. A candidate seeking enrollment in an approved educator preparation program who would like to demonstrate their ability by taking this test prior to admission. Once you provide proof that you meet one of the above criteria, you can register for the test by creating an account online, filling in your information, paying the exam fee of $131 and then scheduling your appointment. The test is offered on a continuous basis but you should schedule your appointment as soon as possible to make sure you get the date and time that you prefer. Once your appointment is set and the fee is paid, you’ll receive an admission ticket. Print this out and remember to bring it with you on exam day. All of the content will be based on the statewide curriculum for these subjects in Texas. There are a total of 200 questions, all multiple choice. In each subject, you’ll see a combination of questions measuring your knowledge of the subject itself and questions measuring your knowledge of how to teach students at this particular psychological-developmental level. Two forms of ID (including at least one that is government-issued). A light sweater or jacket that you can put on if the exam room gets too cold. You should arrive 15 minutes before your actual appointment to check in because the ID verification process can take some time. In some cases, they may require you to verify your identity via fingerprinting, signature comparison, or videotaping. This would be in addition to the two forms of ID you already brought with you. Do not bring a calculator or any other personal items into the testing center with you. There will be an onscreen calculator provided during the portions of the exam where you might need it. While you can take a break when you need, the exam time will not pause for you and you will not be able to leave the testing center at any point during the exam time. Your scores will be available within seven days of completing the exam. A report is not mailed to you but you can view your scores online using the account you created during registration. Once available, your scores will automatically be reported to the TEA so you don’t need to send out score reports. Each subject is scored separately on a scale of 100 to 300. You need to get a minimum of 240 in each core subject in order to pass. If you do not pass, you don’t have to retake the entire exam over again. You only need to retake the subjects that you received a score below 240 in. The appointment for the retake must be at least 45 days after your first attempt. Studying for a test like the TExES core subjects 4-8 takes a combination of learning all of the relevant math, English, and science concepts and developing your ability to recall of that material on command during the test. So each study session should include a combination of methods best suited to those two tasks. For example, using a comprehensive study guide along with a fantastic set of flashcards will give you the tools you need to learn everything you need to know and then retain that information in your brain in preparation for the test. In order to be effective, however, a study guide needs to be sufficiently detailed without wasting time on concepts or information that aren’t likely to appear on the test. The Mometrix study guide is a great example of what a well-focused yet very thorough study guide should look like. It even includes practice test questions to help you apply that information and familiarize yourself with the kinds of questions you’ll be facing on test day. Mometrix flashcards are the perfect complement to their expertly researched study guide. They distill all of the critical concepts from the TExES Core Subjects 4-8 exam into easy-to-use flashcards to help you strengthen your ability to recall the information instantly. They even provide a proven strategy to help you get the most out of these flashcards.